Certain “billionaires” among us would like you to believe that America needs to be Made Great Again. 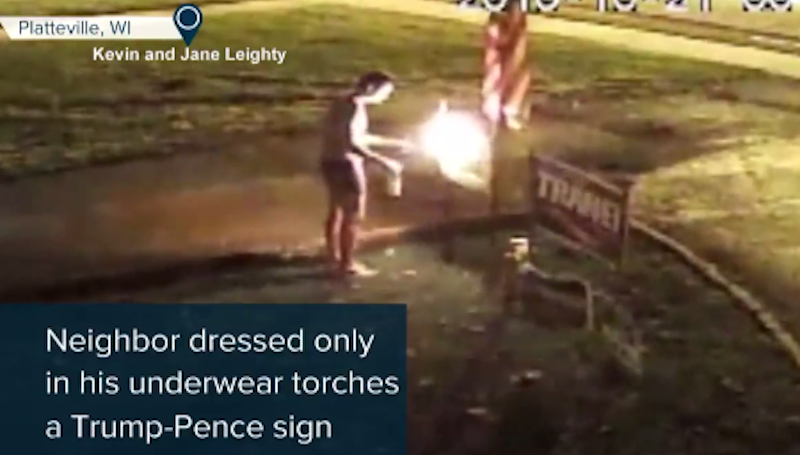 Certain “billionaires” haven’t seen this video of a man in his underwear destroying a Trump lawn sign with a blowtorch. Sign-owner Jane Leighty tells NBC the thing that hurt her most about the early-morning attack was the fact that passersby fist-bumped the blowtorch guy instead of calling the police. Meanwhile, in Philadelphia, a homeowner says a thief clad in a spacesuit stole more than 13 Trump signs from his yard, including one which was apparently stuck 15-20 feet up in a tree. “They had to come with a long pole, there’s just no way — they were way up there,” he told CBS.